With ample swamps, hurricanes, and alligators, Miami may not have been the most logical place to start a city. And in the early years, many people seemed to pass it by. In 1900, the population was a mere 1,000. What a difference a century makes. 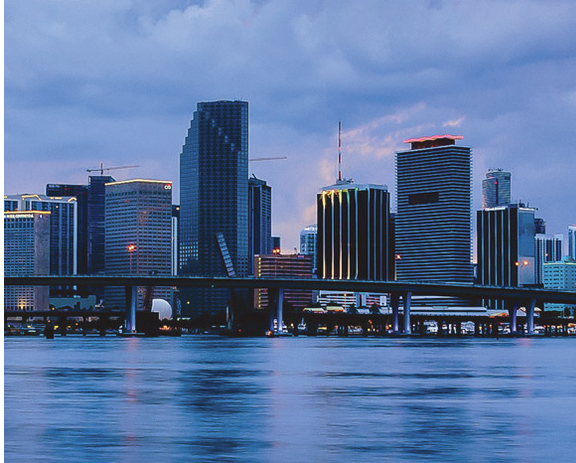 Today, with 2.5 million people, Miami has blossomed from a sleepy backwater to a bustling metropolis, with an insatiable urge to keep growing. And much of that transformative push, which turned warehouses into galleries, spiffed up shopping districts, and added a forest of high-rises along the water’s edge—and most significantly, unequivocally made Miami into a luxury market—occurred in just the last two decades. To be fair, there have been stumbles. Painful busts followed euphoric booms, like the one that flattened the housing market a few years ago. And not everybody’s idea of progress is a skyline of skyscrapers. Other brokers worry that the city is becoming divided into the “have-mosts” and everyone else. Yet one could also allow that Miami’s planners, brokers, and developers might want to take a collective curtain call for their efforts, as they’ve largely proved the old real estate adage: Build it, and build it right—with attention to detail, style, and comfort—and residents will come. “Miami has become a magical place in the last 20 years,” says Russell Galbut, a longtime condo developer who also grew up here. Two decades ago, for instance, “you could roll a bowling ball through downtown and not hit anybody,” he points out, while these days the area pulses round-the-clock with clubs, hip eateries, and coffeehouses. Galbut, who today is managing principal of the firm Crescent Heights, became among South Beach’s largest landlords, and he continues to develop there—his 87-room Gale South Beach hotel on Collins Avenue just opened in December. But he recognizes that the center of gravity has shifted somewhat to the mainland, especially along Biscayne Bay from 36th Street to Brickell. To wit: Zuma chose downtown as the location of its first US restaurant outpost. Similarly, consider the rebirth of Wynwood, whose warehouse-lined blocks have been enlivened with art galleries, eateries, and shops. And in a place that once eschewed foot traffic, people actually walk around there, encouraged by the bright murals that jazz up Northwest Second Avenue. It would likely be music to the ears of late developer Tony Goldman, whose company still owns about two dozen buildings. According to real estate brokers who worked with him, Goldman—credited with the reinvention of New York’s Soho neighborhood in the 1970s—always thought that the area’s low-slung, pedestrian-friendly vibe had great potential, even if the rest of the city still believed the future was about building upward. “I don’t mind high-rises where they belong, but I don’t think a whole city should be made up of them,” says Metro 1’s Tony Cho, a Wynwood-based broker and developer who is turning a denim factory into a Ducati dealership. But sky-high homes became a way of life in the last decade, and they remain popular, Cho points out. At Wynwood’s edge, buildings like 2 Midtown and 4 Midtown, which were built as condos but rented out many of their unsold units over the years, are completely filled up, he says. While in the 1980s South Americans drove much of the demand for real estate, recent years have seen the arrival of buyers from other continents. There are also more full-timers than snowbirds, brokers add. When Ugo Colombo, president and chief executive of condo developer CMC Group, came from Milan to attend college at the University of Miami in the ’80s, you could count the number of Europeans “on your fingertips,” he says. Now, Colombo’s buyers also include Italians, Asians, and Russians, the post-Soviet oligarchs who are snapping up trophy homes in New York City, too; about half the sales over $1 million are estimated to be by foreigners. But Latin Americans are also still here. Brazilians seemed to come en masse in 2009 and 2010. Venezuelans, nervous about President Hugo Chavez’s socialistic reach, turned up in the past few years. Mexicans worried about crime in their country are big buyers. Plus, Argentines looking for safe havens for their cash, in the face of inflation in their native land, began picking up multimillion-dollar condos in 2012, too. To fully understand Miami’s journey, developers say, look to the renaissance of Miami Beach. In the 1970s, its buildings were run-down and inhabited by seniors, who had to contend with low-level street crime. But the Miami Design Preservation League, which was founded in 1976 by Barbara Baer Capitman and her son John Capitman, began to turn things around by restoring the area’s mesmerizing Art Deco architecture, with projects like the restoration of the Cardozo Hotel on Ocean Drive and advocating for historic districts. Star turns in Hollywood and the media—in the movie Scarface, on Miami Vice, and as a backdrop for a well-known photo shoot for Calvin Klein’s Obsession—didn’t hurt its rebound either. Another factor that raised the stature of South Beach was developer Thomas Kramer’s 17-acre South Pointe project in the 1990s, which helped gentrify the area. Still, back then, a one-bedroom residence in South Beach could be purchased starting from $59,000, according to an ad in Ocean Drive’s premiere issue; today it might cost $750,000. As the decade heated up, a gold-rush mentality set in, which often forced developers away from South Beach proper to points further north on the peninsula. Another hurdle was that increasingly assertive preservation laws in the Art Deco section made many large-scale developments off-limits. Developers who flourished in the post-revival era of South Beach include David Martin, whose father, Pedro, emigrated to the US from Cuba in 1961 and continues to work alongside his son. The family’s Terra Group, formed in 2001, built several high-rise condos along Indian Creek Drive, near the Intracoastal Waterway, then jumped over to the Omni area as downtown picked up. Martin is now busy with projects in Doral, which was incorporated in 2003 in a testament to how Miami continues to push outward. The city “has definitely undergone a revolution,” Martin says, explaining that cultural institutions have helped shed its beach-and-body image. Art Basel Miami Beach has drawn art buyers since 2002. In the rush to find the next cool spot, developers have not neglected historic sections. In fact, Coconut Grove, Miami’s oldest real neighborhood and perhaps its most verdant, has seen its fortunes improve in recent years, too. Martin, for one, is now building the Grove at Grand Bay in Coconut Grove, a two-towered, 96-room condo project designed by Danish wunderkind Bjarke Ingels. Nearby, Peter Gardner, of Pointe Group Advisors, is preparing to break ground on Grove Village on Grand, a six-block mixed-use project aimed in part to spruce up the neighborhood’s shopping district, which follows other projects in recent years there. And Gardner may have a good perspective on what works. His great-grandfather, Frank Gardner, came to Florida in 1903 and built homes in Lake Alfred. The youngest Gardner believes Miami’s new-found visibility has a lot to do with professional sports: The Heat, which came in 1988, and the Marlins, in 1993, became effective marketing tools for the city, like the Dolphins, at home and abroad. “You can probably hear 10 different languages at a Heat game if you are listening for them,” he says. As the Heat surged anew in the mid- 2000s, developers, freshly euphoric about the city’s future, seemed to almost trip over themselves to put up condos. Leading the charge was Jorge Pérez, the billionaire founder of the global development giant the Related Group and a former local urban planner. Like mushrooms after rain, his condo towers sprang up across the region, such as 50 Biscayne and One Miami. But the addition of about 100 towers by Pérez and others over the decade, including about 64,000 units introduced in 2006 alone, created a glut of housing that quickly outstripped demand. At the same time, a city that once unflatteringly had the reputation for “land by the gallon” real estate scams saw droves of investors buying and flipping apartments before kitchen counters were even in place, which ran up prices to unsustainable levels, compounding problems. By the end of the decade, condos sat dark and unsold. Between 2006, when housing prices peaked, and 2010, after the credit crunch, two-thirds of all sales in the city were distressed ones, according to an analysis by Miller Samuel, an appraisal firm. Developers were hardly unscathed themselves. Pérez, for one, told Ocean Drive he lost between $1 billion and $2 billion because of projects like Icon Brickell, his opulent two-towered condo, whose struggles were typical of many projects in the last boom. As the market cratered, Pérez slashed Icon’s prices to unload its units, but in the end, lenders took back the property anyway. “Did I take a financial beating? Yes,” says Pérez, who started in 1979 with a 40-unit rehab job in Little Havana but estimates he’s developed “tens of thousands” of condos in Miami and nearby cities. “It was very humbling,” he adds. Indeed, setbacks are temporary, say those who have been around Miami for decades, who observe that boom-bust cycles come with the territory. “But the booms are getting louder and more expensive,” jokes Martin Margulies, who since the 1960s has built about 4,000 condos, explaining that the overall trajectory has been positive. Margulies was also an early proponent in Wynwood; the Margulies Collection at the Warehouse, his contemporary art pieces, opened in 1999. Prices at his latest residential project, the Bellini on Williams Island—with 70 units across 24 stories, each with a private elevator—start at $1 million. But buyers will probably fork over cash. “Many don’t even try to go to the bank,” knowing that loans won’t be available for new condos, he says. Banks are still skittish about home loans, brokers add. But the wave of foreigners who are now buying homes in Miami usually don’t seek mortgages anyway, they say. Overall, Miller Samuel found that about 75 percent of all deals in the third quarter of 2012 were in cash. For developer Nitin Motwani, a board member of the Downtown Development Authority, Miami’s biggest accomplishment in the last 20 years has been its urbanization, as it comes into its own as a city. More people are taking trains than they were before, for instance, and the All Aboard Florida rail project being considered for downtown, which would let people easily commute up and down the coast, could allow that trend to continue. Yet others say a train to Miami Beach needs to be built to make the city truly world-class. Miami’s Real Estate Boom: Then And Now. By C.J. HUGHES. Retrieved from http://oceandrive.com/living/articles/miamis-real-estate-boom-then-and-now.